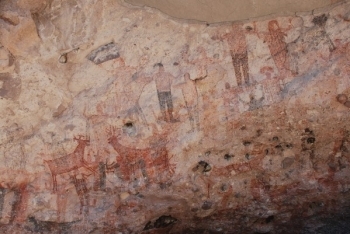 The Rock Paintings of Sierra de San Francisco is the name of the prehistoric rock art found in Baja California, Mexico. They are representations of what was once the life of the Cochimi or Guachimis in the Baja California peninsula. These paintings on the roofs of rock shelters and on the walls of Sierra de San Francisco were first discovered by the jesuit Francisco Javier in the eighteenth century. The property is made up by around 250 sites. We packed in for a camping trip with local guides, mules, and donkeys. The terrian is rugged and the views are out of this world. I managed to stay a day in a fresh water lagoon which I affectionitly call the viper pit. You do need a guide, and the hikes are always up, and the shade in the shelters are a great place to mediate and view the colorful panels. You could stay a week and still need more time. Try to visit when it is NOT summer. Contiguous National Sites: Is completely surrounded by the land area of the Vizcaino site but was extracted from that nomination at the evaluation/inscription stage "Following the recommendation of the Bureau, the original nomination of the mixed site of El Vizcaino was resubmitted as separate cultural and natural nominations" (Report of the 17th session of the WHC). Its evaluation document is however still titled "Vizcaino"!